What is managed identities for Azure resources? The managed identities for Azure resources feature in Azure Active Directory (Azure AD) solves this problem. The feature provides Azure services with an automatically managed identity in Azure AD. You can use the identity to authenticate to any service that supports Azure AD authentication, including Key Vault, without any credentials in your code. The managed identities for Azure resources feature is free with Azure AD for Azure subscriptions. There's no additional cost. Client ID - a unique identifier generated by Azure AD that is tied to an application and service principal during its initial provisioning. Principal ID - the object ID of the service principal object for your managed identity that is used to grant role-based access to an Azure resource. Azure Instance Metadata Service (IMDS) - a REST endpoint accessible to all IaaS VMs created via the Azure Resource Manager. The endpoint is available at a well-known non-routable IP address (169.254.169.254) that can be accessed only from within the VM. How does the managed identities for Azure resources work? A system-assigned managed identity is enabled directly on an Azure service instance. When the identity is enabled, Azure creates an identity for the instance in the Azure AD tenant that's trusted by the subscription of the instance. After the identity is created, the credentials are provisioned onto the instance. The lifecycle of a system-assigned identity is directly tied to the Azure service instance that it's enabled on. If the instance is deleted, Azure automatically cleans up the credentials and the identity in Azure AD. A user-assigned managed identity is created as a standalone Azure resource. Through a create process, Azure creates an identity in the Azure AD tenant that's trusted by the subscription in use. After the identity is created, the identity can be assigned to one or more Azure service instances. The lifecycle of a user-assigned identity is managed separately from the lifecycle of the Azure service instances to which it's assigned. Internally, managed identities are service principals of a special type, which are locked to only be used with Azure resources. When the managed identity is deleted, the corresponding service principal is automatically removed. Your code can use a managed identity to request access tokens for services that support Azure AD authentication. Azure takes care of rolling the credentials that are used by the service instance. Lifecycle Shared lifecycle with the Azure resource that the managed identity is created with. When the parent resource is deleted, the managed identity is deleted as well. Independent life-cycle. Sharing across Azure resources Cannot be shared. The same user-assigned managed identity can be associated with more than one Azure resource. Workloads for which you need independent identities. For example, an application that runs on a single virtual machine Workloads that run on multiple resources and which can share a single identity. Workloads that need pre-authorization to a secure resource as part of a provisioning flow. Workloads where resources are recycled frequently, but permissions should stay consistent. Azure Resource Manager receives a request to enable the system-assigned managed identity on a VM. 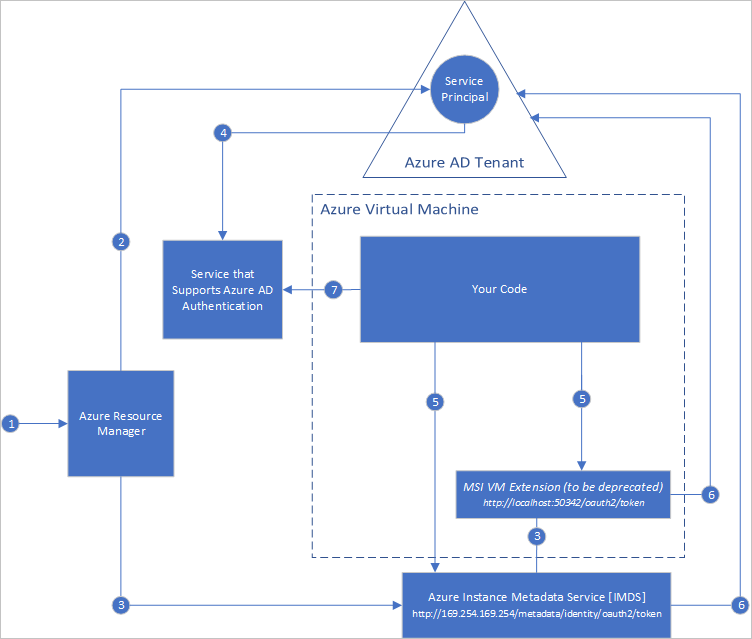 Azure Resource Manager creates a service principal in Azure AD for the identity of the VM. The service principal is created in the Azure AD tenant that's trusted by the subscription. Updates the Azure Instance Metadata Service identity endpoint with the service principal client ID and certificate. After the VM has an identity, use the service principal information to grant the VM access to Azure resources. To call Azure Resource Manager, use role-based access control (RBAC) in Azure AD to assign the appropriate role to the VM service principal. To call Key Vault, grant your code access to the specific secret or key in Key Vault. The resource parameter specifies the service to which the token is sent. To authenticate to Azure Resource Manager, use resource=https://management.azure.com/. API version parameter specifies the IMDS version, use api-version=2018-02-01 or greater. Your code can also request a token from VM extension endpoint, but this is planned for deprecation soon. For more information about the VM extension, see Migrate from the VM extension to Azure IMDS for authentication. A call is made to Azure AD to request an access token (as specified in step 5) by using the client ID and certificate configured in step 3. Azure AD returns a JSON Web Token (JWT) access token. Your code sends the access token on a call to a service that supports Azure AD authentication. Azure Resource Manager receives a request to create a user-assigned managed identity. Azure Resource Manager creates a service principal in Azure AD for the user-assigned managed identity. The service principal is created in the Azure AD tenant that's trusted by the subscription. Updates the Azure Instance Metadata Service identity endpoint with the user-assigned managed identity service principal client ID and certificate. After the user-assigned managed identity is created, use the service principal information to grant the identity access to Azure resources. To call Azure Resource Manager, use RBAC in Azure AD to assign the appropriate role to the service principal of the user-assigned identity. To call Key Vault, grant your code access to the specific secret or key in Key Vault. You can also do this step before step 3. The client ID parameter specifies the identity for which the token is requested. This value is required for disambiguation when more than one user-assigned identity is on a single VM. The API version parameter specifies the Azure Instance Metadata Service version. Use api-version=2018-02-01 or higher. How can I use managed identities for Azure resources? To learn how to use managed identities to access different Azure resources, try these tutorials. Check out the Implementing Managed Identities for Microsoft Azure Resources course for more information about managed identities, including detailed video walkthroughs of several supported scenarios. What Azure services support the feature? Managed identities for Azure resources can be used to authenticate to services that support Azure AD authentication. For a list of Azure services that support the managed identities for Azure resources feature, see Services that support managed identities for Azure resources.